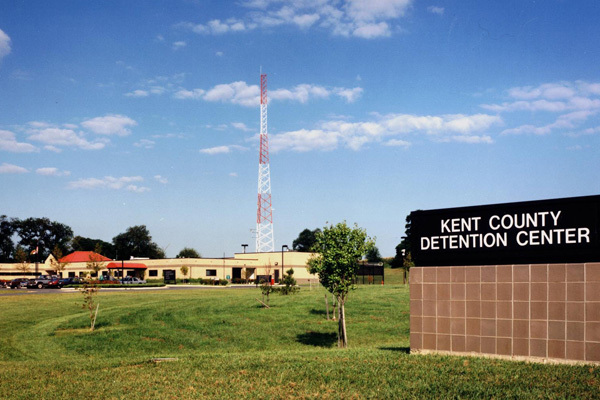 Kent County Detention Center is small scale county detention facility consisting of 41 male and female beds located northwest of the Town of Chestertown. Kent County Detention Center is situated in an agricultural/residential area of Eastern Shore, Maryland. This 22,000 gsf detention center facility replaced an aging, site constricted local jail in downtown Chestertown, a facility having very limited expansion capabilities. Most of the inmates incarcerated at Kent County Detention Center derive their residency from towns and villages located on the Eastern Shore of Maryland. The building is constructed as noncombustible structure using a combination of cast-in-place concrete columns and beams, precast concrete infill panels and concrete masonry wall unites.